Update your bathroom with the Avanity 49-inch sleek Vitreous China Vanity Countertop with integrated rectangular basin. Featured in a classic white finish to blend flawlessly with your decor, this vanity top offers clean and simple transitional styling. Its seamless, 1-piece design also offers ample counter space and is easy to clean. It comes pre-drilled for standard 8-inch widespread faucets. 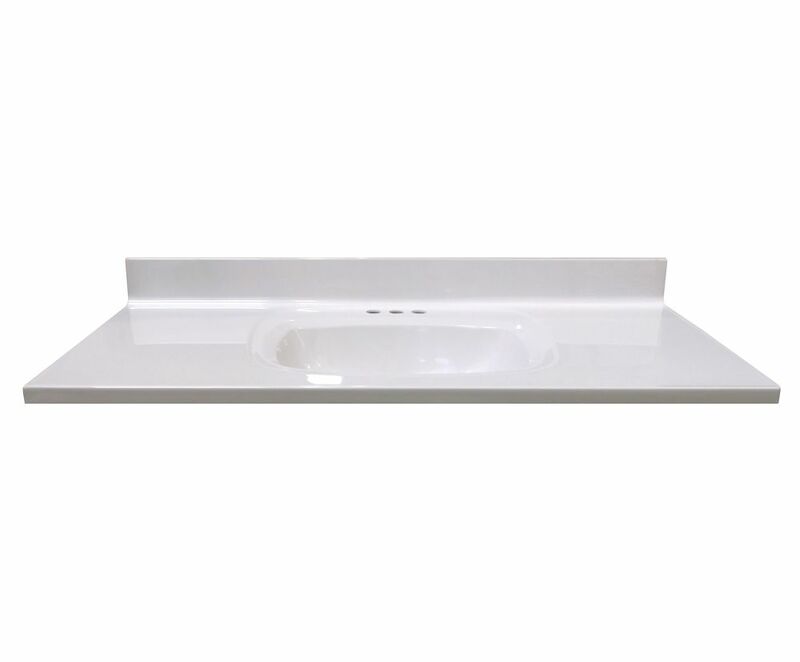 49-Inch W x 22-Inch D Vanity Top in White with Rectangular Recessed Bowl Add a sophisticated look to your bath. Our cultured surfaces provide durability and a heightened resistance to thermal cracking. 49-Inch W x 22-Inch D Vanity Top in White with Rectangular Recessed Bowl is rated 4.0 out of 5 by 5. Rated 5 out of 5 by Jackie from Simple and beautiful I bought this 3 weeks ago and the sink is a good quality fits perfectly from our old style and looks great on our vanity. Rated 4 out of 5 by Joandles from Good product Bought this about 2 months ago. Very happy with it. Looks even better than the online pictures. Rated 2 out of 5 by Vikki from Broke right away I bought this a couple months ago but we didn’t unbox and install it until this week because we hadn’t bought a new cabinet to mount it to until recently. unfortunately, as we were securing it into place we realized it has a hairline crack we hadn’t noticed running on the underside. I don’t think it’s going to be reparable and since it’s glued into place already, I doubt it can be returned. Really disappointed in this product. I have it 2 stars instead of 1 because it looks nice and it’s easy to clean, but that’s useless to me if it’s likely going to end up cracking right through to the top within the first year of purchase. Rated 4 out of 5 by Russ from Love this vanity top!!! Purchased to go with an antique dressing table which we adapted. Arrived promptly and well packaged. Very competitively priced and well made. Our plumber said it required an oversize drain piece which was a fairly minor issue, otherwise we are thrilled. Rated 5 out of 5 by Tlee from Love my new countertop/sink Bought it online & waited patiently for it to be delivered, love it, great customer service when I wanted to track the package. Can this vanity top be cut somehow? How about an angle cut? If yes, how would you recommend to cut it, what preferred tool? Hi Lise, genrally we do not entertine our guest to cut the vanity top due ti its fragile nature and it may lead in to damage. If cutting is the only option, you have to do it at your own risk and make sure if any damage occured during the process it will not be coverd under warranty. Is this a solid, pure white or is it 'marbled or speckled&quot; in any way? what are the width and depth of the actual sink in the middle of the counter top? The Width is 17&quot; and the depth is 13&quot;.